Marking blue, layout stain, or Prussian blue is a dye used in metalworking for layout on unfinished parts for further machining. It is sometimes called Dykem (after a popular brand). 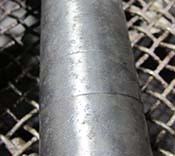 It is used to stain or paint a metal object with a very thin layer of dye and then is scratched off using a scribe to reveal a bright, yet very narrow line in the metal underneath. The advantages are that any existing scratches are covered with the dye and the new lines have a contrasting background. 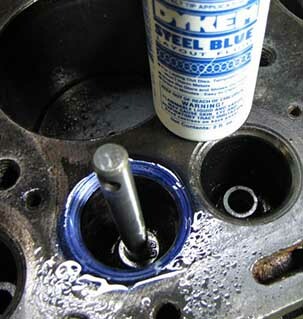 Dykem like fluid, is difficult to remove because it is made to be permanent and tough to remove on purpose. It must withstand machining coolant and heat as part of the normal use. Layout fluid is usually composed of methylated spirits, shellac, and dye. Hand wiping with rags saturated in Dykem Remover solvents is the standard removal technique. Hand wiping with solvent is slow, hazardous, and labor intensive. 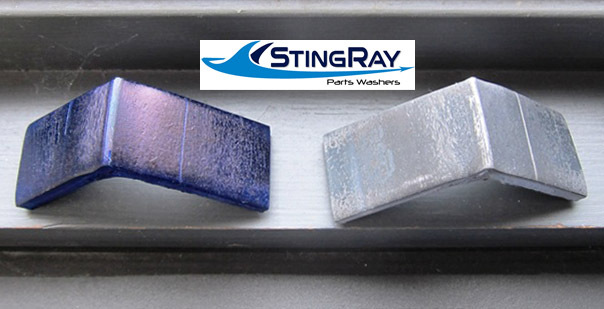 Click Here to see StingRay Parts Washers in ACTION! Using solvent Dykem Remover on iron and steel parts for machining is labor intensive. 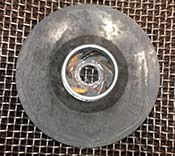 Removal of industrial metal marking fluid coated on cast iron, steel and machined steel parts with aqueous parts washing is easily accomplished in a StingRay Parts Washer with Power Kleen Detergent. Dykem removal in a StingRay is a result of a carefully designed aqueous cleaning process. 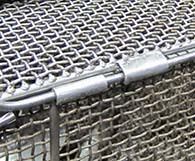 Removal of metal marking fluids in a StingRay requires all four cleaning factors: A washing temperature above 185 degree F (85 C), the proper mild alkaline detergent (Power Kleen IIL tested), high hydraulic impact pressure with a power density of 0.4 or more, and a short 10 to15 minute power wash cycle using the unique StingRay parts washer oscillating manifold. Most components with Dykem to remove are clean and ready for inspection in short 15 minute cleaning cycles. The StingRay power wash cycle consists of wash, rinse, rust protection, and flash dry. 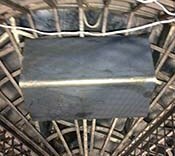 Dykem removal from steel parts is easily done in a StingRay aqueous parts washer. 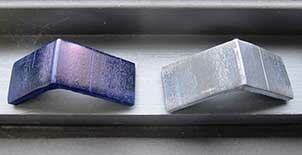 The results shown from a 15 minute Power Wash demonstrate how the parts washer replaces solvent based Dykem remover. 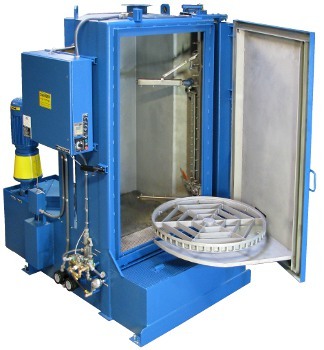 "Click for larger view"
Dykem with a a StingRay Aqueous parts washer is an ideal method that saves manual cleaning labor, eliminates hazardous cleaning solvents, and speeds up manufacturing processes. With a StingRay parts washer your valuable machinist time goes to work making more parts rather than removing Dykem from parts. A StingRay washers pays for itself with savings in labor. Using the StingRay parts washer delivers more work output with the same number of machinists. 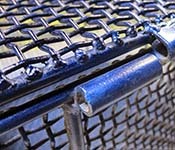 Dykem on new parts and repair parts is easily removed in short wash cycles utilizing the StingRay Power Wash Process. Using the hydraulic impact force of a heated cleaning solution, the proprietary power wash process out performs all other types of aqueous parts washers. The unique oscillating power blast manifold bombards parts with high temperature and high pressure cleaning solution at a different angle of attack each time the turntable revolves. The wash cycle concludes with a heated fresh water rinse containing a rust inhibitor solution in a closed loop-zero discharge cleaning cycle. 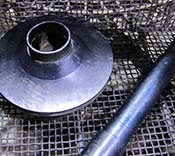 Parts flash dry in under two minutes producing parts that are Dykem free, rinsed, rust proofed, and dry. Dykem removed from steel components in a 15 minute power wash with a StingRay SR4040 Parts Washer. Cleaning Dykem with a StingRay parts washer eliminates solvent cleaning by hand. "Click image for larger view." 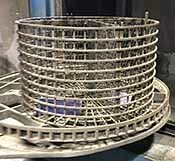 A StingRay parts washer removes Dykem using the unique power wash process. The optional SHIM doubles power density and increases impact energy to make Dykem cleaning fast, low cost and without hand detailing.